Dorothy Shum, MD, is an Associate Clinical Professor in the Ultrasound Section in the Department of Radiology at the University of California, San Francisco, and she is also the chief of the ultrasound section at Zuckerberg San Francisco General Hospital (ZSFG). Dr. Shum is fellowship trained in abdominal imaging with additional subspecialty training in ultrasound. 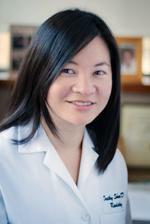 Dr. Shum received her medical degree from Brown Medical School, Rhode Island in 2005, and completed her residency at Kaiser Permanente Medical Center, Department of Diagnostic Imaging in Los Angles, California in 2010, followed by a fellowship in Advanced Body Imaging at the Keck School of Medicine of USC, Los Angeles in 2011. Nakanishi A, Shum D, Morioka H, Otsuka E, Kasamatsu H. Interaction of the Vp3 nuclear localization signal with the importin alpha 2/beta heterodimer directs nuclear entry of infecting simian virus 40. J Virol. 2002 Sep; 76(18):9368-77. Li PP, Nakanishi A, Shum D, Sun PC, Salazar AM, Fernandez CF, Chan SW, Kasamatsu H. Simian virus 40 Vp1 DNA-binding domain is functionally separable from the overlapping nuclear localization signal and is required for effective virion formation and full viability. J Virol. 2001 Aug; 75(16):7321-9.